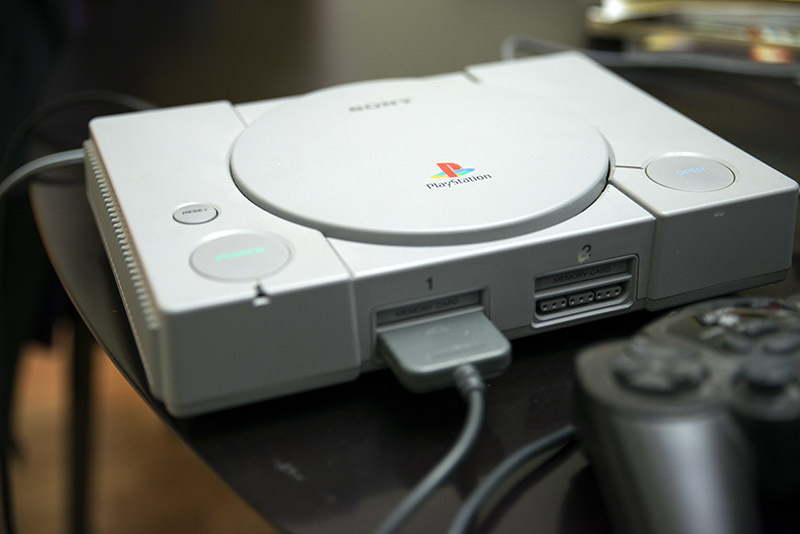 MEASUREMENTS: Sony Playstation 1 (PS1) - SCPH-5501 as CD player. Imagine, audiophiles using an "archaic" (circa 1994) game console as a CD player for thousands of dollars worth of expensive amps and speakers downstream! That Stereophile article reviewed the first PS1 version which was the SCPH-1001. Instead of that older model, what I have here is the slightly later SCPH-5501; said to be superior for audio by some PS1 aficionados! 1) An improved Nichicon SMPS that generated less heat that could distort adjoining plastic components such as the lid and chassis that could lead to mistracking or binding of a spinning CD disk. 2) Positioned the laser assembly away from the power supply to reduce heat damage and RFI noise. 3) Implemented an auto-biasing feature for proper tracking. Model SCPH-1001 requires manual biasing of the laser circuitry to maintain tracking. He goes on comparing the PS1 with other gear he has. Good read. I can't verify the comments but it certainly sounds well thought out and worth considering. 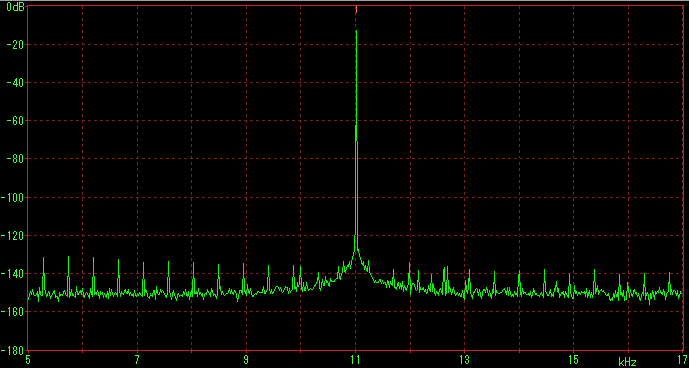 For those wondering, the AK4309 is a 1-bit delta sigma "bit stream" DAC. Notice the lack of RCA direct outputs at the back; there's a supplied multi-AV cable with RCA out instead. 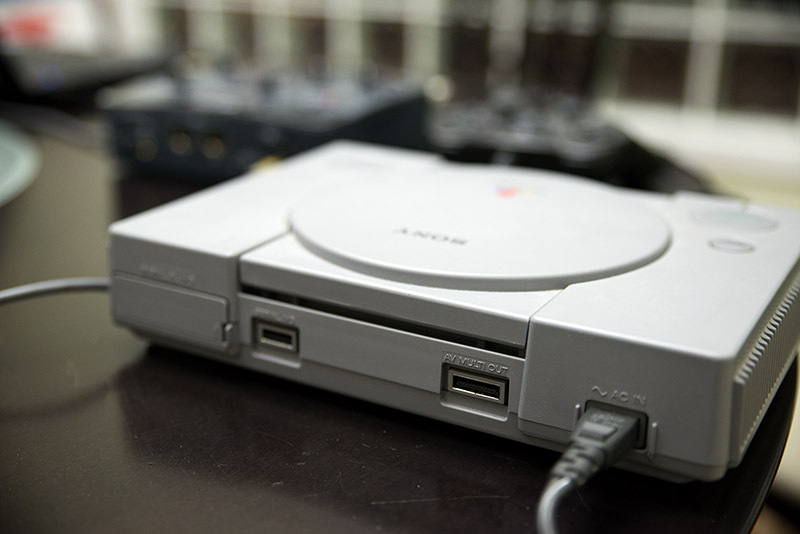 I used the stock PS1 power cable as per the photograph. As you can see, for convenience in comparison, I included the 16/44 results for a number of the other DAC/streamer units I measured over the last while. Compared to the rest, the PS1 is clearly outmatched in terms of dynamic range. These measurements indicate that it's capable of around 15-bit dynamic range. At first, I thought it may be the fact that this is a CD player with all kinds of electronics in there perhaps lowering the dynamic range. 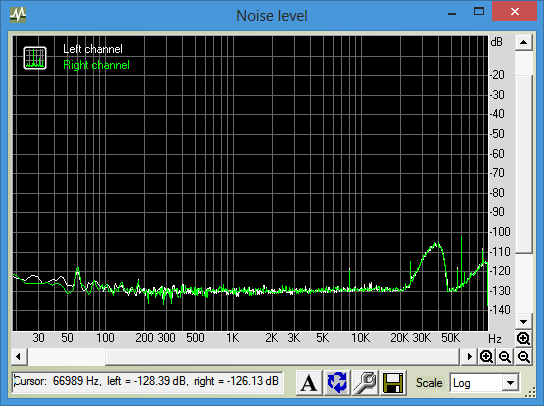 However, when you have a look at the AK4309 datasheet, indeed the rated dynamic range for this part is 'only' 90dB. 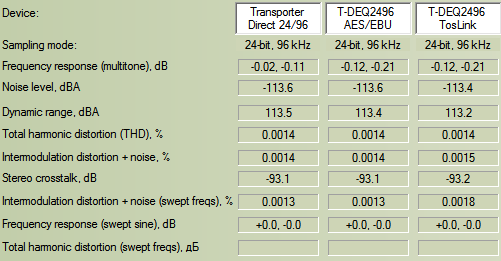 Since the Transporter uses the newer generation AKM DAC (AK4396), here are the THD plots in comparison. 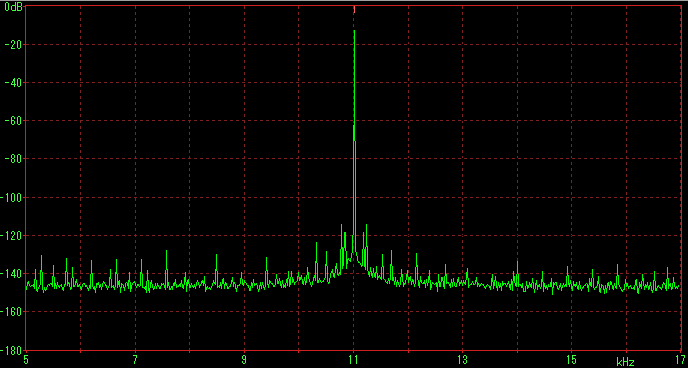 Obviously, the Transporter is capable of measurably lower noise level with a cleaner graph notably above 10kHz. Looks fine. 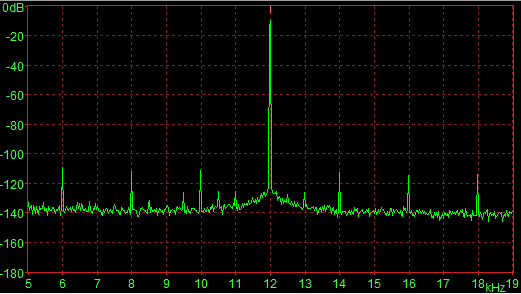 Sidebands peak below -100dB from the primary 11kHz signal. There you go, the Sony Playstation 1 SCPH-5501 measured as a CD player. I can't say how it sounds compared to the even older "first-version" SCPH-1001 but as I quoted above, there are reasons to believe this version should perform better. Last night, for some late-night R&R, I listened with this unit through my AUNE X1 as headphone amp with Sennheiser HD800 headphones. Tunes on tap: Muddy Waters "My Home Is In The Delta" (downsampled Classic Records HDAD), Cat Stevens "Wild World" (2011 Analogue Productions), Nat King Cole "The Very Thought Of You" (2010 Analogue Productions), Akon "I Wanna Love You", eRa "The Mass", Joe Satriani "Crowd Chant", Jheena Lodwick "It's Now Or Never", Stephen Layton & Britten Sinfonia "For Unto Us A Child Is Born" from Handel's Messiah. They all sound great through the headphones. Nice details throughout, bass nice and deep on "I Wanna Love You", no accentuated sibilance with female vocals (that Jheena Lodwick track can be nasty), "The Mass" may have sounded a bit congested during the louder & more complex segments but really nothing to detract from enjoyment. I do not believe the measured 'limited' dynamic range negatively affected enjoyment at normal listening levels at all. Remember that ~90dB dynamic range is better than the majority of analogue sources. Clearly compared to modern DAC's, the PS1 has inferior noise performance and concomitantly lower dynamic range. The other measurements like THD and IMD are respectable and jitter is not of concern. 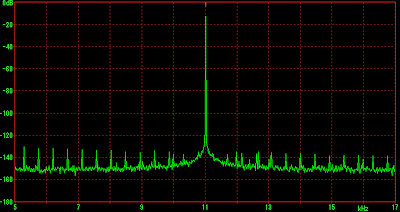 If we look at the TDA1543 DAC unit (DAC chip designed around the same era), the NOS unit has better dynamic range but with much more THD and IMD along with the typical high frequency roll-off at 44kHz sampling rate (of course you could feed the NOS upsampled 88/96kHz data to smooth this out). Between the two ultimately, it's one of subjective preference, especially for a "colored" DAC like the TDA1543 NOS (I've yet to measure a tube analogue output DAC). 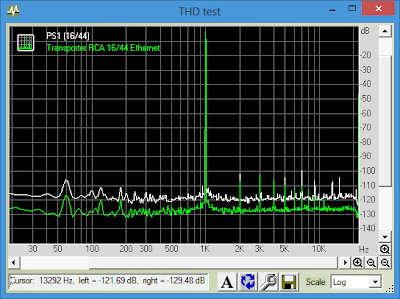 Personally, I'm of the "technically perfect" camp and would probably pick the PS1 over the TDA1543 even if a bit noisier - reasonably low level of noise like this is generally less objectionable than distortion. MEASUREMENTS: Pioneer DV-588A - DVD-A and SACD "universal" player! Hey guys, remember the SACD vs. DVD-A "war" back in the early-mid 2000's? In the heat of the battle, it was nice that a few manufacturers gave us these "universal" DVD players that could handle both competing formats. 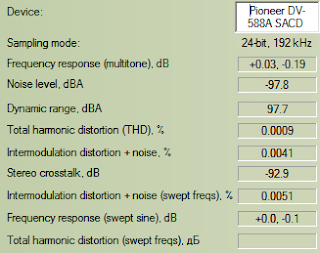 Pioneer was one of them and in mid-2003, released to the world the very reasonably priced DV-563A (~$200). A year or so later, this model under consideration, the DV-588A was released. I remember browsing around Future Shop (owned by BestBuy these days) in 2005 to pick up this unit since my previous Panasonic DVD player failed on me. At <$200, I figured I couldn't go wrong since this would 'in a pinch' also play my small collection of DVD-A and larger collection of SACD's. The innards of this player revolves around the MediaTek MT1389EE SoC chipset which graced many <$400 players back in the day (including the Oppo DV-981HD and Sony NS955 [chip apparently relabeled as Sony CXD9804R]). Although it has been said that this chip is capable of "PureDSD", I do not believe any of the lower priced units operated in this mode because multichannel and bass management were performed in the PCM domain. 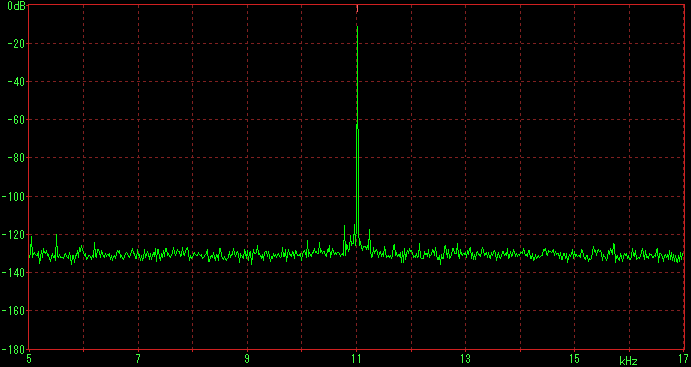 As a result, the 1-bit DSD (actually DSD64 for the 64 x 44.1kHz = 2.8224MHz SACD sampling rate) in these machines are converted to 24/88 prior to conversion by the DAC (supposedly a BB DAC is used in this unit). 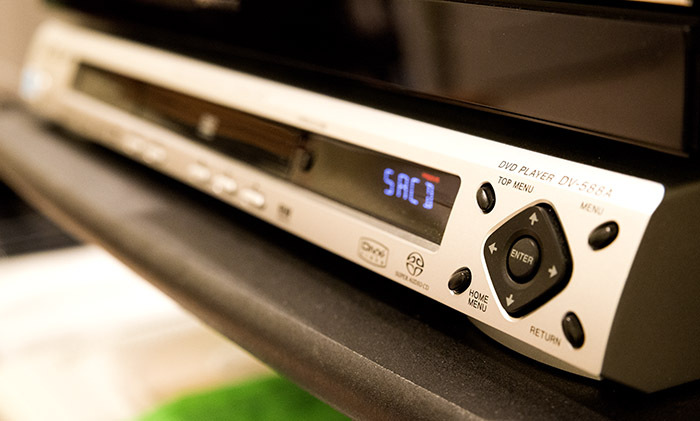 With the advent of PS3 SACD digital ripping in 2011 and a firmware upgrade to the Pioneer, this unit joined the ranks of the relatively few SACD players capable of playing backup SACD-R's. 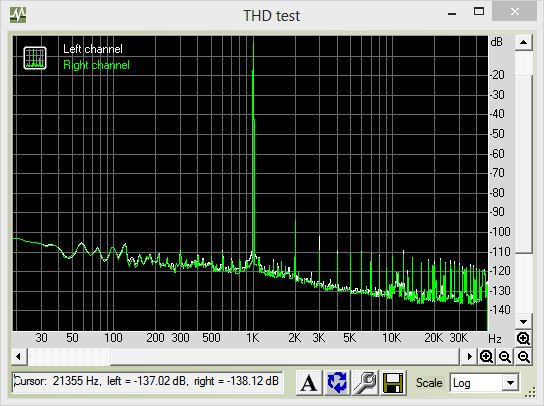 Given the low price, let's see how well this player measures... First I created a DVD-A with the RightMark test signals along with the J-Test to have a look at how it performs as a hi-res PCM unit. - Equipment plugged into Belkin PureAV PF60 power filter (same general setup as what I used for the Transporter previously). 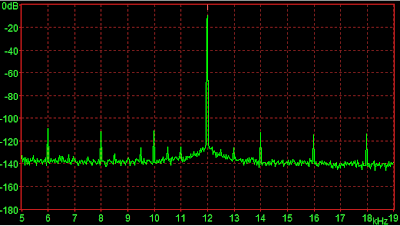 Quite jittery as you can see with a number of sidebands congregated +/- 1kHz around the 12kHz main signal. 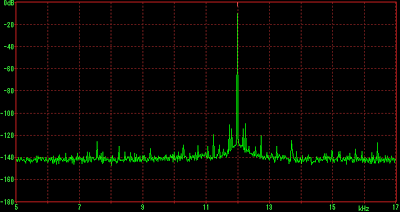 Now as I mentioned above, this player is capable of SACD-R playback. 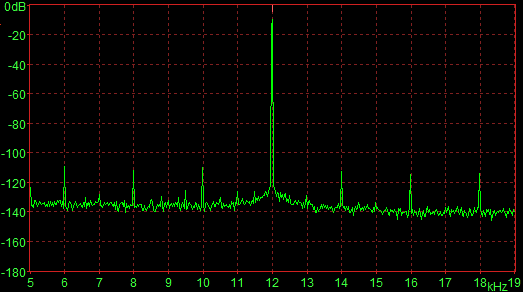 So, I downloaded KORG AudioGate and went about converting the 24/192 PCM RightMark test and calibration signals and 24/48 Dunn J-Test into DSD64. With the help of a friend who's into this stuff, we got the tracks authored onto a SACD-R for testing. Not good... Just marginally better than DVD-A 16/44. 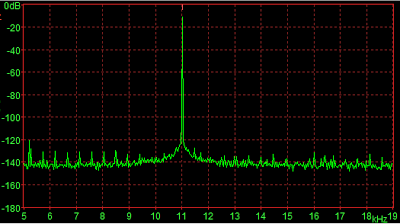 Note that extra "bump" at 25 to 44kHz thanks to the DSD noise shaping (absent in the PCM noise graph above) - remember that this is a log scale so it's all scrunched up in the corner. 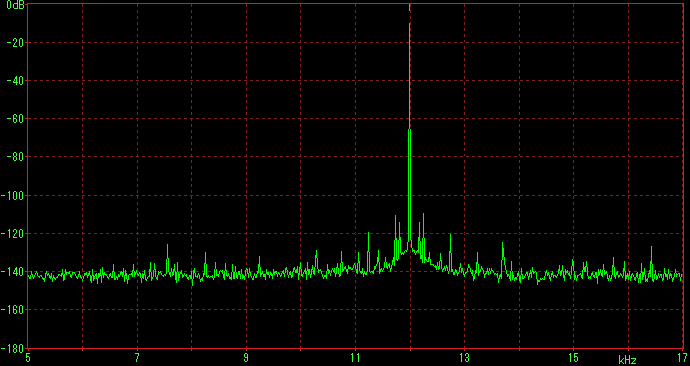 The fact that the noise gets truncated at ~44kHz makes sense for the 24/88 PCM conversion, that's why I wondered above if AudioGate is cutting off the frequencies of the test signal earlier at 30kHz. 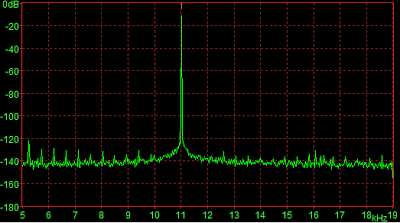 It's cleaner than the PCM graph above. 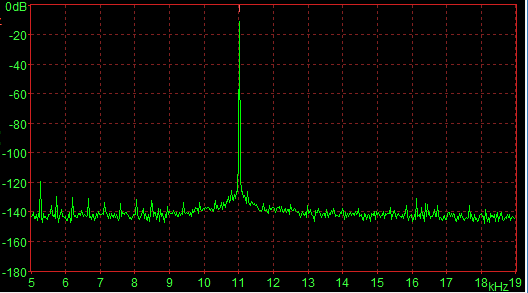 Possibly the resampling from DSD to PCM done internally - like ASRC's - is cleaner than the direct PCM from the DVD transport (I don't think it has to do with corruption of the LSB jitter modulation tone since even a straight 12kHz sine wave looks very jittery in DVD-A). Hey, I got to measure a DVD-A / SACD player with my custom SACD-R & DVD-A disks :-)! 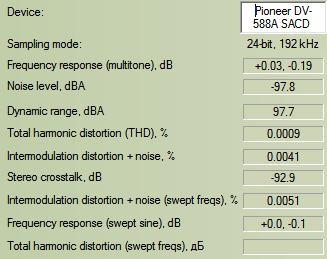 I've often wondered how this old Pioneer compared in terms of SACD vs. DVD-A playback. Subjectively, I've always thought it sounded good but not exceptional. I never bought the same title on both DVD-A and SACD to actually compare how the two would sound. Even if I did, there would be no assurance that the mastering would be identical anyways. Although I have about 30 SACD's still, they're barely listened to compared to the computer music server and my Squeezebox players. The fact that I do have a dedicated SACD changer still (the venerable Sony SCD-CD775) also means I don't bother with the Pioneer for music playback the few times I spin a disk not for the purpose of audio ripping. Overall, the objective data points to a 'fair' DVD-A player for its price and a 'mediocre' SACD player with dynamic range just a hair above that of an ideal 16-bit CD. Of course I'm converting my test tracks from PCM to DSD and then the player is re-converting back to PCM again so this will affect the sound quality negatively... Furthermore, I haven't played with AudioGate enough to get a sense of how good it is as a PCM to DSD converter compared to something like Weiss Saracon which is much too expensive for the casual hobbyist. Nonetheless, since RightMark is measuring dynamic range at 1kHz (should be quite good for DSD64), it should still measure better than what I got assuming the digital data conversion was done competently and the 24/88 internal conversion algorithm is good. The question of course is how well does a good "pure DSD" SACD player measure compared to something like this budget Pioneer? Can anyone suggest a good SACD unit to try which can play back SACD-R's? 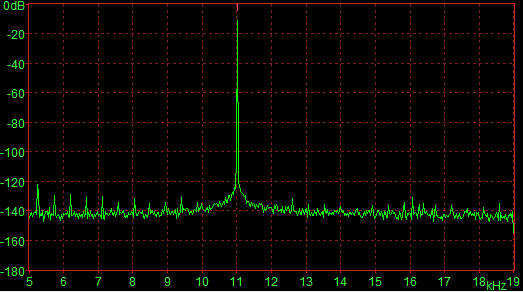 While I would not be able to test out all these assertions, I think we can logically deduce that IF timing is an issue and can be altered by computer load (whether due to OS, player software, FLAC decode, etc...), we should see some kind of anomaly with the Dunn J-Test when the computer gets busy in realtime. 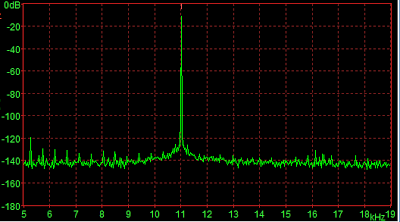 Here's a video showing realtime analysis of my computer's motherboard TosLink audio sent to the AUNE X1 DAC. Realize just how "basic" this setup is... I'm using just the built-in motherboard TosLink straight to the $200 DAC. 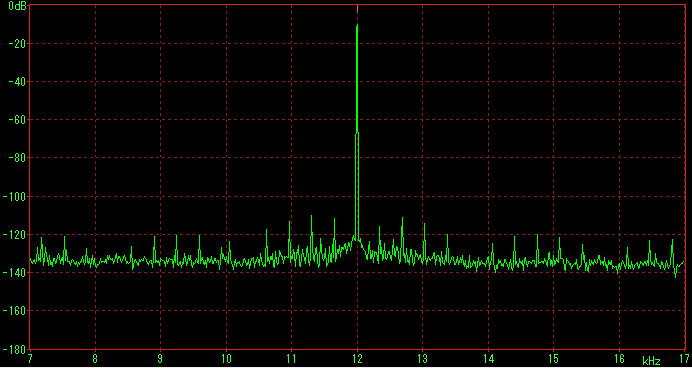 As I have shown so far in the other tests, jitter is measurable between different interfaces. 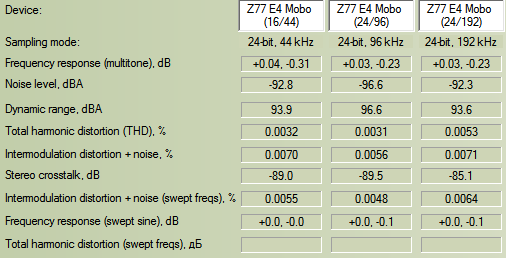 Also, electrical noise is easily measurable (for example, see the "NOISY i7" condition with the Essence One testing). 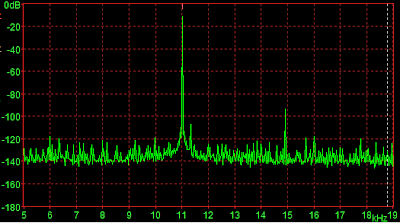 However, I am still unable to show that multitasking or running the CPU at high load has any ability to change the timing/jitter characteristics of the Dunn J-Test significantly much less to an audible degree. 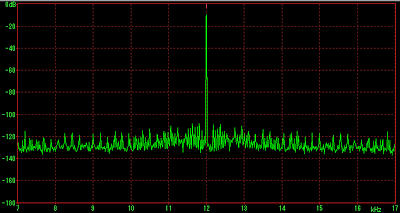 As far as I can tell, the jitter phenomenon is a property of the digital hardware interface itself (ie. 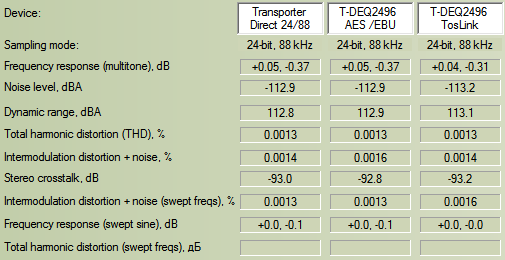 TosLink and adaptive USB tend to be worse than coaxial, AES/EBU, and asynchronous USB). Therefore, my suspicion/belief is that so long as the computer software player is functioning properly (ie. 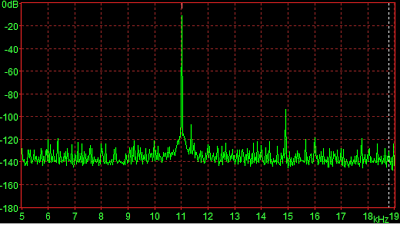 no buffer under runs, feeding a bitperfect driver like ASIO), then there should not be any jitter issues other than the limitation of the computer-to-DAC interface (at least in this case with a modern CPU & motherboard chipset). Realize that this finding is very good! 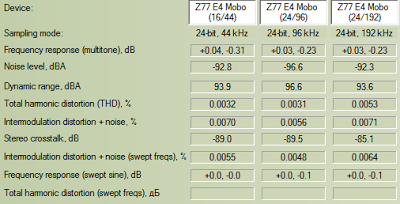 It means that we're free to do stuff like realtime transcoding and use of fancy upsampling algorithms without fear that somehow it will deteriorate the sound and that jitter is an independent variable not affected by the audio processing itself. 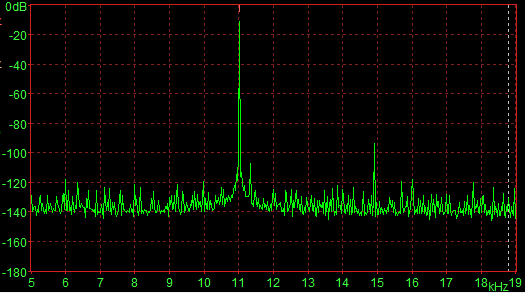 If anyone has reason to believe otherwise, I'd love to have a look at the test set-up and evidence of software-induced jitter (especially if it's audible!). 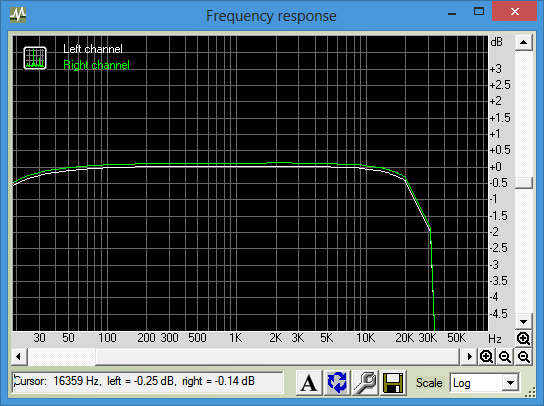 Summary - OK for 16-bit audio in terms of noise floor and dynamic range. Incapable of going beyond 16-bit dynamic range at best with 24-bit audio data. 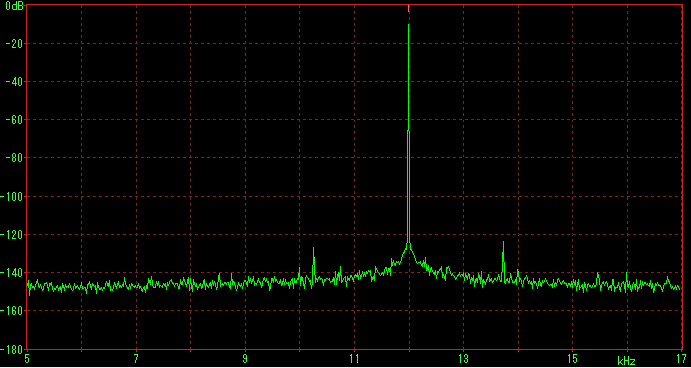 I suspect this is quite typical of on-board sound output. Notice the deterioration with 24/192. 2. 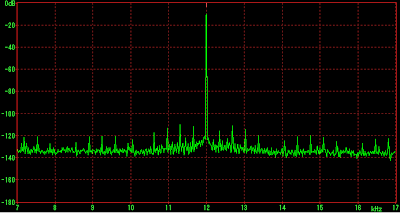 Does the jitter pattern from the motherboard's analogue output itself get worse with increased CPU load? Used the 24/48 J-Test like in the video above (that one was of course with the computer TosLink). Conclusion: The motherboard's internal DAC is relatively jittery compared to the USB DAC's tested below. But symmetrical jitter sidebands are no different whether CPU or GPU load high. Bottom line... 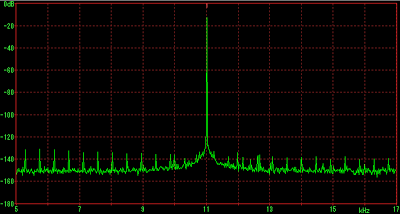 I can't even seem to stimulate more jitter with the motherboard's own internal DAC by increasing CPU or GPU load. 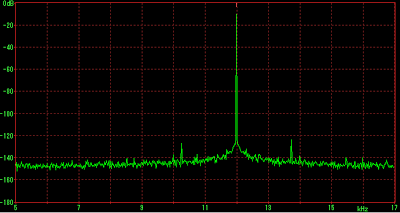 One consistent finding though is that bit of noise between 8-9kHz - usually whenever I strain the GPU. Computer with 6 threads running 100% + USB HD copying files at 25MB/s running off the external USB hub! No difference... 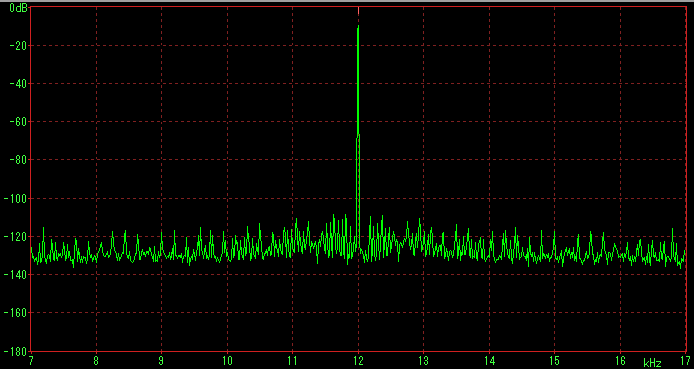 Yawn... Can't even get the adaptive USB DAC to show me bad jitter under these kinds of USB conditions! No difference... 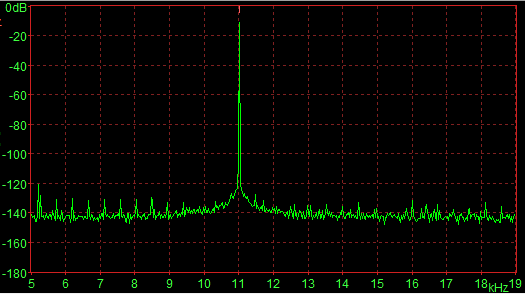 Very good graphs with minimal jitter (the spikes are primarily the 16-bit jitter modulation signal from the J-Test). Clearly the asynchronous interface is better even going through the TosLink. 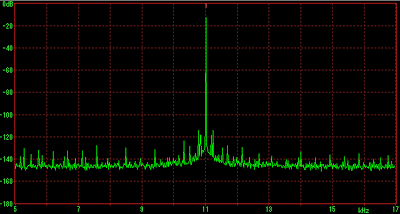 This whole 'jitter' thing is getting tired and boring :-). Yawn... 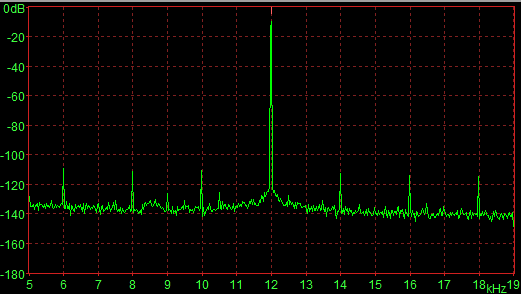 I'm not using any exotic or expensive gear at all and yet I can't even get jitter anomalies to show up despite the strain I've put on the CPU/GPU and USB interface. MEASUREMENTS: Transporter TosLink vs. AES/EBU Behringer DEQ2496 Loopback. 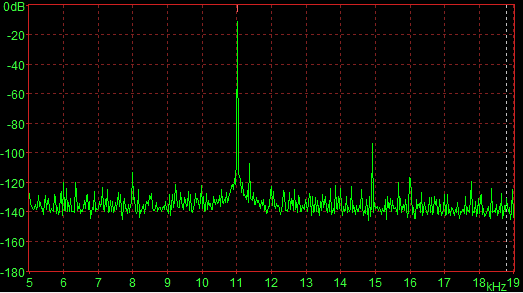 A little while ago, I demonstrated that the TosLink loopback with the Behringer DEQ2496 in line worsened the Transporter's jitter measurements significantly here. 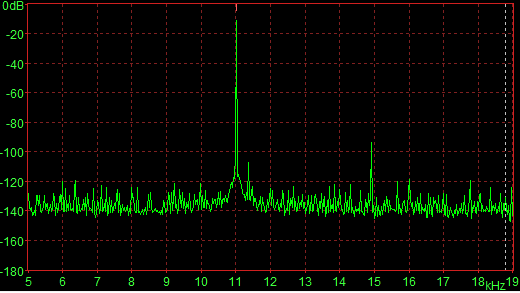 Although I do not believe the extra 2ns or so of jitter was audible, I wondered if using an alternate interface than TosLink would have improved the situation. Although the Behringer doesn't have a coaxial SPDIF, it does feature the AES/EBU interface which is a digital balanced cable for me to try. So, I got a couple of 5' Mogami W3080 + Neutrik connector cables for total ~$65 shipped to take the AES/EBU interface for a spin. For the TosLink condition, I'm using 2x3' generic plastic TosLink cables instead of the AES/EBU. The upper table contains 24/88 measurements - these days, it seems more hi-res is available in 24/88 (often SACD/DSD conversions), I figured it would be good to have a look to make sure it all measured well. The lower chart are the same conditions at 24/96. Note that these are the RCA output measurements so a little lower than with the XLR results posted before. Note that there is some inter-test variability compared to my previous results with the Transporter but generally we're talking <1dB difference. As you can see, from the analogue perspective, there isn't any difference whether I'm measuring the Transporter DAC directly, or if it's running through a total of 6' TosLink or 10' AES/EBU through the Behringer DEQ2496. 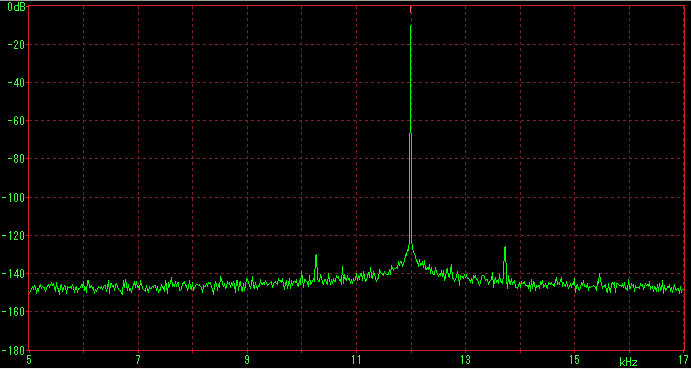 At 16/44, the Transporter is very clean for both direct and AES/EBU loopback. 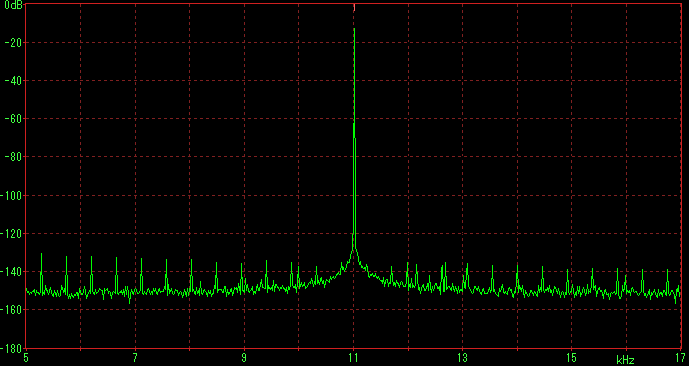 Most of these spikes are just J-Test modulation products from the 16-bit signal being recorded in 24-bits. 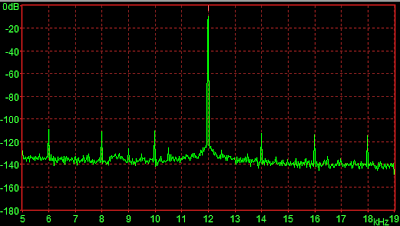 As you can see, the TosLink loopback is considerably worse with more sidebands congregated around the primary 11kHz signal. 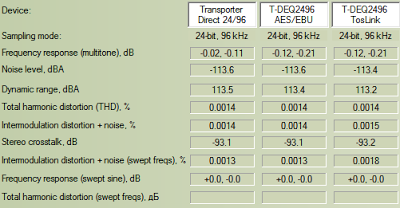 You can also see that using the TosLink interface with the Transporter slightly raises the absolute noise floor in general. 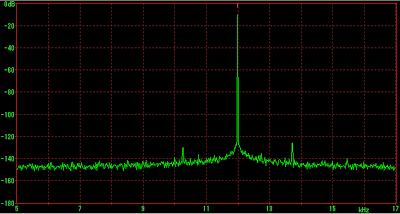 The AES/EBU loopback does add a small amount of jitter to the graph but it really is quite insignificant! 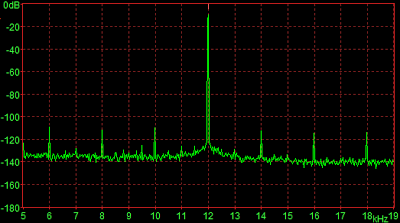 These graphs look a bit different from the previous Transporter jitter measurements because I'm measuring RCA output (rather than the XLR from before which has a lower noise floor). Nonetheless, the results are the same in terms of jitter - TosLink is significantly worse. Well, I think that's it for my suite of Transporter measurements... The practical side realizes that jitter at these levels even with TosLink doesn't make an iota of difference playing real music. However, the audiophile seeks for "perfection" in as much as it's possible. Using AES/EBU digital cables instead of TosLink in this loopback configuration with the Behringer DEQ2496 for room-EQ does not add any significant extra jitter within the resolution limits of my test equipment. Cool.